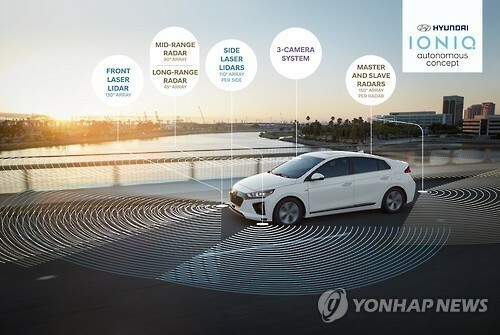 South Korea’s leading automaker Hyundai Motor Co. is planning to show off its self-driving technology at the largest consumer electronics show in Las Vegas next month, the company said Thursday. Two models of Hyundai’s Ioniq hatchbacks -- one electric and one hybrid -- will hit the road without a driver during the annual Consumer Electronics Show, which will be held from Jan. 5-8. Hyundai unveiled its self-driving Ioniq concept car at the the Los Angeles Auto Show on Nov. 16. The car has received the highest level of driving automation from the US National Highway Traffic Safety Administration. Hyundai Motor and its sister company Kia Motors last year joined a growing list of companies pushing autonomous driving. In November 2015, the group unveiled its plans to invest $1.7 billion by 2018 to develop a smart car which integrates autonomous driving and the latest IT technologies. The company has a goal to produce self-driving cars by 2020. On Monday, the company signed a memorandum of understanding with the city government of Hwaseong, Gyeonggi Province, to develop “Vehicle to Everything Communication System,” or V2X. V2X is a core communication technology among vehicles, passengers and infrastructure, aimed to improve safety. The company said it will be building infrastructure for V2X system while the city will provide necessary traffic signal data and assistance. At the CES, Hyundai will also be introducing its technology under the theme of ‘innovation for mobility freedom’ at the CES, the company said.